This past weekend I went and visited my folks. It was nice, it’s been a while since I visited so that was extra nice, hate not seeing them for so long, time just flies! I flew into Portland, and hung out with my sister for a few hours, then headed out to Long Beach WA (Just north of Astoria, home of the The Goonies ) for the weekend. Long Beach is one of those sleepy little beach towns, where money and motivation seem to not weigh as much on people’s souls. For better or worse, folks seem to move at their own pace, LOL. 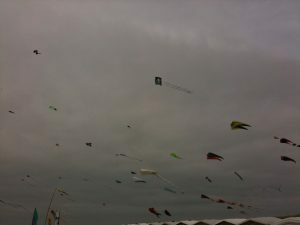 As it happened it was also the Annual Kite Festival, and one of the nicer weekends for the festival in years (I’m told). The sun was out a lot, the breeze was just enough to lift kites, but not so gusty as to destroy them. It’s cool to see so many kites just anchored and staying aloft all day. So many interesting kites. One day we drove down to Seaside (I think that was the town) to hang out. It’s a tourist trap for sure, but it was an beautiful day, sunny, warm when not in the shade. A great day for walking around. The rest of the weekend was spent hanging out around town, relaxing, eating REALLY REALLY fresh Salmon and of course Taco Time :) It’s fun to just kick back enjoy the beach weather and just hang out with my folks, and talk about whatever. I didn’t bring a camera, but of course had my trusty iPhone 3GS, so you can take a look at the pics I took on Flickr or Facebook. While I wish Long Beach had cellular service, I was giddy when I stumbled across a bar or two of EDGE, it was kinda nice to be a bit disconnected. My folks have broadband, so I was connected enough to record an episode of the Summer of Flash, and check mail and such, but only by ethernet cable. My Kindle was able to connect so I still got my morning Kindlefeeder delivery (it’s like a morning newspaper, but only what I want to read). All in all I had a great time and came home ready to tackle whatever comes my way!